#3 Entering your first Battle! Where bugs and issues are created! Been on holiday :). I had a jam session with a friend of mine. Anyway, we quite often improve and make music on the spot. Being sick of only playing the white keys on the keyboard I wanted to try some of the black keys. However to sound good, I had to play in key. Here’s a little something which hopefully helps you! Not only is this table useful, but you can also see some patterns emerging. Like, all the #’s originate from the vii diminished. The flat’s originate from the IV. 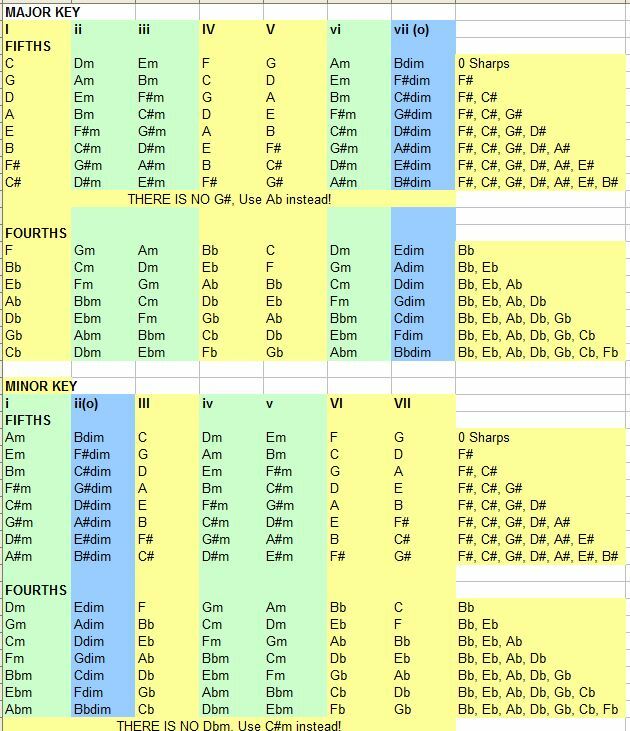 Notice how each minor key and major key has a pair? All the chords are the same. I think this is what they refer to as the ‘relative minor/major’ ie. Am = C, Em = G etc… So if you learn just the Major Keys, you already know most of the minor key stuff, just a slight alteration in the ‘root’ position. Playing in C Major is nearly the same as playing in Am, except that your ‘Tonic’ or root of the Key is now Am instead of C…. haha I hope that makes sense. Check this website out! I sort of copied it, but I also created one for Minors. I live in Auckland, New Zealand - one of the best cities in this world I must say! Love Electronics, music, food and badminton and touch rugby!